With our pressed compact discs, which are also called Unitized compact discs on the market, almost without exception all hard-to-reach places and corners of a workpiece or assembly can be machined without great effort. The tool – which can be selected from very flexible to very hard – does not attack the geometric shape of the workpiece to be machined in any way. By using pressed compact discs with the right hardness, high-quality surfaces can be achieved quickly. The aspect of process time optimization must also be considered due to the long service life of the pressed compact discs. From a safety point of view, pressed compact discs offer more safety than, for example, conventional deburring tools (braid brushes, etc.). 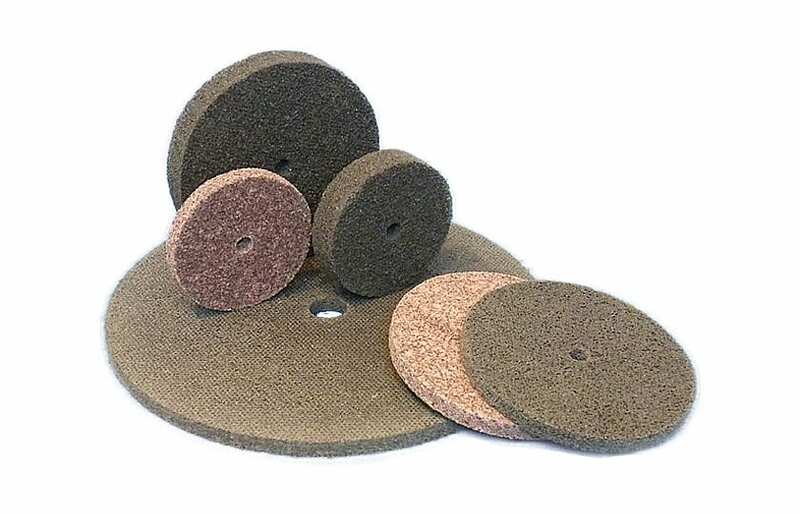 The pressed compact discs consist of multi-layer pressed, high-quality, three-dimensional fibre fleece impregnated with abrasive grain cast in synthetic resin. The type of fleece and the resin insert can be varied. These two design options alone create a very broad product portfolio for pressed compact discs, ranging from extremely aggressive deburring tools to perfect surface finishing tools. For this reason, the pressed compact discs are divided into different degrees of hardness from 1 (soft) to 10 (very hard). The areas of application for pressed compact discs are many and varied. Pressed compact discs are often used in hard-to-reach areas. With pressed compact discs, material can be processed in a simple and consistent way and provided with the desired surface structure.